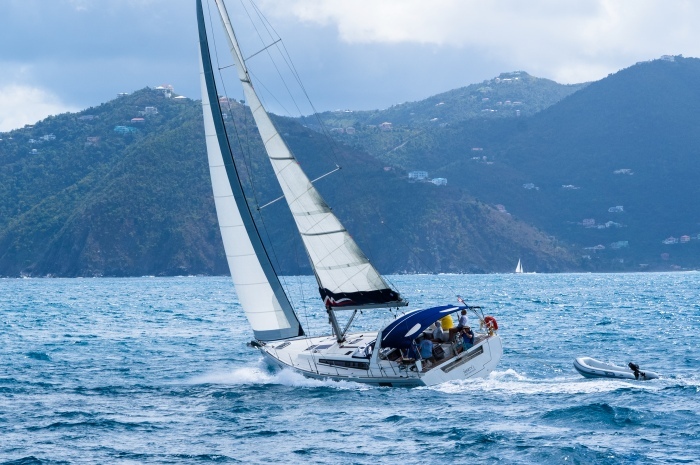 When Offshore Sailing School developed the course curriculum and registered the name Fast Track to Cruising® in 2006, it set the stage for the most comprehensive and successful catamaran sailing course in the country. Don’t be fooled by copy-cats who claim to teach the same course. There is only one program – the Fast Track to Cruising® Course taught by Offshore Sailing School’s professional instructors – that truly gives you the knowledge, skills and confidence to handle sailboats up to 50’ in just about any weather, without hired captain or professional crew. Whether you have no sailing experience, have sailed small sailboats or are returning to sailing after a long hiatus, this in depth sailing course is perfect for you. The Offshore Sailing School Fast Track to Cruising Course has no prerequisites. You can focus on catamaran sailing skills or monohull sailing skills. When you enroll you will receive US Sailing textbooks that cover what is asked on the certification tests. If you read the books in advance you will be well-prepared for our heralded course curriculum which includes classroom training and hands-on keelboat sailing lessons, then a full course of monohull sailing lessons or catamaran sailing lessons. You learn from professional, experienced instructors who receive accolades from their students on course evaluations. See the “What You Learn” tab below for more details. Cruising Course was amazing!! Our instructor was fantastic. We are both educators and appreciated his attentiveness to making sure we understood the concepts and skills we achieved. The 2 days on the Colgate definitely prepared us for the bigger boat, which by the end of the week we were very comfortable taking out by ourselves. Even with 8 years of sailing we couldn’t imagine just coming and chartering a big boat without taking this class first! The first two days of your Fast Track to Cruising sailing lessons are on a Colgate 26 in OSS 101– a high performance open-cockpit keelboat daysailer, used by the US Naval and Coast Guard Academies for training plebes and cadets. Then you board one of our cruising boats – a 40′ to 48′ catamaran or a 43′ to 50′ monohull for OSS 103/104 – and learn to handle the same boats you will soon charter in the Caribbean or elsewhere around the world! Whether you are a beginner or already have some sailing experience and feel competent handling small to mid-sized sailboats, this is the most successful program there is for Bareboat Charter Certification. Offshore Sailing School has been the exclusive sailing school for the most prominent charter company in the world for over 37 years. Our standard monohull for Bareboat Cruising Certification in the BVI is a Moorings 50.4, fifty feet of sheer fun that gives you the confidence to charter any size boat anywhere! Offshore Sailing School cruising course graduates are also “Captains” in The Moorings preferred charter program, and get charter discounts after completing this monohull or catamaran sailing course. Just ask the two largest charter companies in the world – The Moorings and Sunsail – how much they value our more than 8000 recent graduates of the Offshore Sailing School Fast Track to Cruising course. Fast Track to Cruising sailing course as a single you could make life-long friends with others aboard (never more than 4 students per boat). The first two days, you learn the basics on a Colgate 26, while sleeping ashore at night. Then you board a cruising sailboat for your monohull or catamaran sailing lessons, and ultimately receive your Bareboat Cruising Certification. At course end you sail with your classmates, while your instructor either stays ashore or silently relaxes aboard. Most charter agencies do not allow night sailing and require that you are anchored, docked or on a mooring before sunset. Night sailing is not covered in this course, but is covered in our coastal passage making (OSS 106) courses, the next step in your learning process. The Fast Track to Cruising® Course prepares you for big boat ownership and charter cruising on your own, without professional captain and crew aboard (called Bareboat Cruising by charter companies). Depending on weather conditions and the learning pace of all in your class (maximum four per boat per instructor unless you opt for a Private Family Course), the following knowledge and skills are learned and practiced in your catamaran sailing lessons. Bareboat Charter Cruising Course: Sleep at the resort or at home while you learn to sail a catamaran or monohull during the day, a great format for those with accompanying family or friends who are taking the 5-day Learn to Sail or Performance Sailing course, or no course at all, or for those who prefer the privacy and amenities of a hotel room at night. 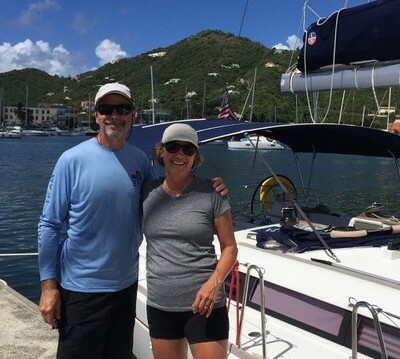 The Catamaran Bareboat Charter Cruising Course (live ashore throughout the course) is not available in Florida, but is available in the British Virgin Islands. Live Aboard Cruising Course: The Live Aboard Crusing Course is available on catamarans and monohulls in Florida and the British Virgin Islands. You board the boat and live aboard while moving from port to port for 6 days, a unique learning experience that immerses you in the cruising lifestyle, with classroom aboard before setting sail each day, sleeping in a private or shared cabin, sharing common space, meal preparation and other tasks with classmates. You do all the cooking and cleaning up, just like you would if you were bareboat chartering. There is no chef and the instructors do not cook your meals. Cooking aboard is part of the learning process. 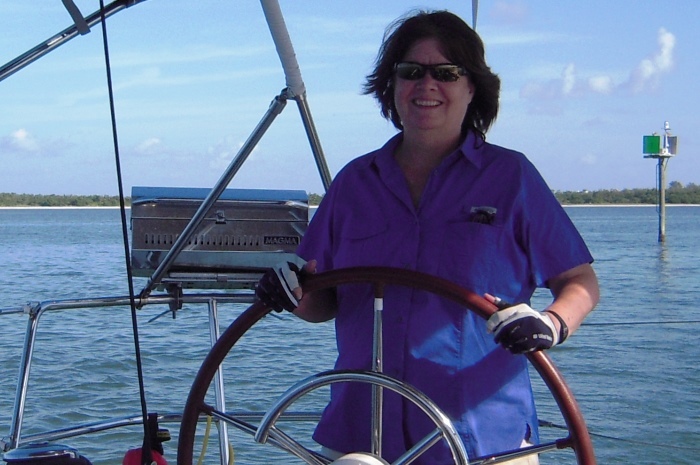 Three Certifications: US Sailing Basic Keelboat, Basic Cruising and Bareboat Cruising are included in your course package (normally a $150 cost). Unless you’d rather not take the certification tests, the US Sailing Basic Keelboat, Basic Cruising and Bareboat Cruising textbooks are sent in advance in addition to our Fast Track to Cruising textbook. Please visit Our Locations for Fast Track to Cruising Course packages. Rates include everything listed below, vary by season, location, type of boat (monohull or catamaran), and whether you choose a shore-based or live-aboard course. Not included are meals unless otherwise noted, travel and other expenses you may incur. Sample schedule for resort based courses – may vary depending on weather and which location you choose. Sample schedules for resort locations, vary depending on weather and which location you choose. Offshore Sailing School knows we cannot thrive without great employees and products. All graduates are asked to fill out an evaluation at the end of the course. The following testimonials come from those evaluations and individual correspondence with recent graduates of the Fast Track to Cruising® Course. Many are happy to correspond by email or phone with you. If you would like us to put you in touch with anyone below, please call 888-454-7015 or email sail@OffshoreSailing.com. My husband and I have been bareboat chartering for the past 10 years. It was our 17 year old daughters that wanted to get certified. They wanted to ensure that they could sail on their own one day. We took the live aboard as a family and took our knowledge and skills to the next level. We all now know “why” we make each sail adjustment, tack, jibe, etc. Sailing is now a bigger thrill than ever. One of the most productive vacations I have ever been on. The instructors were amazing, I learned a lot and had so much fun. I can’t stop telling everyone I know how cool this experience was. I will be sending my parents this trip as a gift. It is obvious that Offshore Sailing School puts a lot of effort in their selection of instructors. Our instructor, Jim Marvin, did an exceptional job. It was obvious he was very knowledgeable about sailing, but what impressed me the most was his ability to teach. My wife and I have very different learning styles. Jim recognized that quickly and adjusted his teaching where we were both able to grasp the subjects covered and apply them in an actual sail experience. This was a family course for us and my two children (9 and 11) were a little apprehensive at times throughout the week. Despite that, on our sail Friday without an instructor, they all put what they learned to work and we had an excellent day at sea! We thoroughly enjoyed the class and look forward to getting back out on the water with newly gained confidence in sailing. I learned a lot and feel confident in my sailing. The course also encouraged teamwork. My husband and I did this trip as an anniversary gift and Christmas gift. I was very pleased with the course and our working together. It was a good marriage/teambuilding experience. Terrific experience, very impressed. Bart was exceptionally patient on the water. For a complete novice like myself I cannot believe how much I learned about sailing. It was a huge amount of material, and I am surprised how much I learned in a short period of time. We can’t wait for summertime sailing on the Chesapeake. Mark and I chartered a cat for our June wedding and sailed it from Annapolis to St. Michaels with some of our wedding guests aboard. Our honeymoon was spent sailing! Both instructors had an unbelievable wealth of knowledge and were able to impart it with ease. Outstanding bonding experience with my teenage son and other classmate. Jacek is a natural teacher – very patient, allowed us to do everything so we learned a faster pace. He put me at ease with regard to testing and handling the boat, loves sailing, and it was contagious. This was a stretch for me, but I am very glad I did it. I am unlikely to sail the world, but will definitely take on our lake and sail with our grandchildren! I thought the experience could not have been better. We learned a tremendous amount and had lots of fun at the same time. Jacek was the key to our successful journey into proving our sailing and cruising skills. Mark is an amazing instructor! As a corporate trainer myself I know how difficult it can be to let the student experience and learn. LOVED how he explained the why and how first, then demo’d and then gave great feedback to help learn. I felt very comfortable as the solo gal with three experienced male students. AMAZING experience! So happy I chose Offshore!! My experience at South Seas and with the Offshore Sailing School was incredible. I couldn’t believe I’d learn to sail a 43’ Jeanneau in a week, but by the end of the course I feel comfortable on the water and ready to sail even more. Highly recommend, especially for those who haven’t sailed before. This course greatly exceeded my expectations. I am very new to sailing, but this experience has opened my mind to a whole new world. I thank Offshore Sailing for providing a course where I was able to spend some very valuable time with my family. Excellent course, much more comfortable with bareboat sailing and now looking forward to bareboat cruising. Michael was great with helping our kids enjoy the course, Garren was very patient on the water and very kind to our children. Book a Cruising Course Today!